The latest edition of the Lonely Planet guide to India points one to a small tomb located in the heart of Srinagar. The Lonely Planet goes on to say that the theory around this tomb is that it could possibly be the final resting place of Jesus Christ as popularized by the thriller The Rozabal Line. The tomb is called Rozabal and has been closed to visitors for almost a year owing to the surge of tourists reading The Rozabal Line as well as the Lonely Planet’s description. At the heart of this matter lies the fact that the tomb at Rozabal is viewed as the final resting place of two Muslim saints—Syed Naseerudin and Yuz Asaf—by local Muslims. On the other hand, there are those who support the view that Yuz Asaf was none other than Issa, or Jesus Christ. My novel, The Rozabal Line, is a piece of fiction that builds upon this notion that Yuz Asaf could have been Jesus Christ and that his bloodline may continue to survive in Kashmir till the present day. Before The Rozabal Line was published there had been several works of non-fiction on the same subject. For example Jesus Lived in India by Holger Kersten, Jesus in Kashmir: The Lost Tomb by Suzanne Olsson, The Fifth Gospel by Fida Hassnain, The Unknown Life of Jesus by Nicolas Notovich and Jesus in Heaven on Earth by Khawaja Nazir Ahmad. Unfortunately there are few readers interested in non-fiction about a relatively obscure tomb. The Rozabal Line, on the other hand is a thriller. To that extent, the book has succeeded in bringing much of this rich historical and theological material to the attention of ordinary readers. The notion that Jesus may have left a bloodline came to my attention in late 1999 when I read Holy Blood Holy Grail by Michael Baigent, Richard Leigh, and Henry Lincoln. A couple of years later, I read some of the material on Rozabal and was fascinated with the idea that Jesus could have been inspired by Buddhism and that he may have drawn much of his spiritual learning from India. The fact that the Russian explorer Nicolas Notovitch had found Buddhist scrolls that specifically referred to Issa—or Jesus—at the Hemis monastery in Ladakh was also a point that fascinated me. I knew that I needed to put all the various sources together and build a story around it. Of course, my novel starts with a disclaimer that it is a work of fiction. I have never claimed that my novel is a version of the “truth” because in matters of religion I think that there is indeed nothing more relevant than personal belief, and what one believes may not be the same as another. However, I do personally think that there are far too many oddities to be wished away as mere coincidence. My effort has been to highlight each of these little nuggets of information as part of the overall story. Consider the fact that the father of Judaism, Abraham, had a name in which you can remove the first letter and by simply placing it at the end get Brahama! There are hundreds of these oddities and riddles in my novel. Many of my readers have written to me that they enjoyed the novel much more when they read it a second time because they were able to pick up all the little hidden treasures. 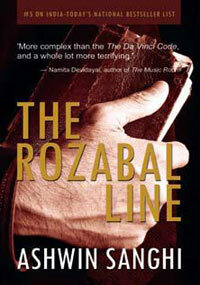 The Rozabal Line is not merely a thriller about the occupant of the tomb at Rozabal. It’s also a story that has a karmic basis. Past lives are used to explain present day and future occurrences. In the world of karma there is nothing that can be labeled as good or bad—it merely is. My objective of writing The Rozabal Line was not to get the reader to love or hate specific characters but to highlight the fact that all actions are rooted in karmic events. If you have not read The Rozabal Line as yet, please do. The novel has been compared quite often Dan Brown’s Da Vinci Code, but nothing could be further from the truth. Read it for yourself and find out.